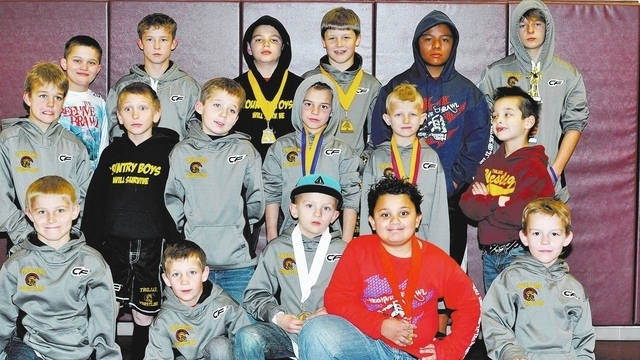 The Pahrump Valley Junior Trojans wrestlers were on the road last weekend and traveled to Richfield, Utah for the Beehive Brawl Nationals. The team sent 18 wrestlers to the competition and the tournament had around 1,300 wrestlers from all over the United States. According to Pahrump Junior Trojans Coach Ray Cortez, his wrestlers finished 33 out of 109 teams and the tournament was won by a Southern Nevada team, Green Valley of Henderson. Trojans Coach Stephen Keefe was happy for the team. “I was surprised to see we had no first-place kids. The kids saw kids they never saw before. It’s really good to do well there; look at all the kids that went to it. It was a nationally recognized tournament and out of the kids that were there, very few were run of the mill. They were the very best from their teams. It was pretty good to have that many place winners on a tournament of that scale,” he said. “They have an excellent program and to be honest I try to model our program after theirs,” he said. The Junior Trojans have three tourneys left in Las Vegas and then the Southern Nevada championship on March 1 and the state championship in Winnemucca on March 7, 8, and 9.